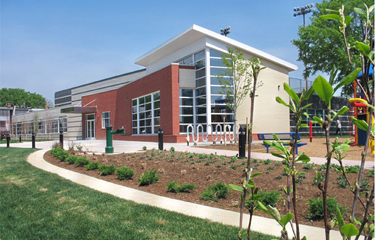 Trinidad Recreation Center is owned and operated by the DC Department of Parks and Recreation. It is located at the corner of Childress and Holbrook Streets NE, in the Trinidad neighborhood. The recreation center, which was built in 2007 and was awarded LEED certification in 2009, has an indoor gymnasium, a multi-purpose room, a weight room, an arcade/game room, a computer room, and an arts and crafts room. The Friends of Trinidad Recreation Center is a committee of the Trinidad Neighborhood Association, and is organized by neighbors to identify both the needs and resources to support the community recreation center. Since the city’s recreation budget is not adequate to address the needs of this neighborhood asset, the Friends of Trinidad was formed to bridge the gap. The Friends of Trinidad maintains a formal partnership with the Department of Parks and Recreation in order to facilitate the improvement and beautification of the recreation center. We are the voice of the neighborhood. Bolster programming for all members of the community, from young children to seniors, by leading classes and recruiting volunteer instructors, by organizing special programs and events, and by working with DPR staff to ensure a full roster of programming options. Beautify the building and grounds so that Trinidad Recreation Center is nice place to be, with regular clean-up days, gardening events, and anti-littering programs. Engage community partners to bring our neighbors and local businesses and organizations together for the betterment of the recreation center. Raise funds to provide equipment for programs and classes so that there is no barrier to participation, and to host community events at the recreation center for the enjoyment of all our neighbors.